While I have yet to see the first installment, and generally disapproved of Peter Jackson’s decision to release this comparatively short story as a trilogy, I would be remiss if I didn’t post about the new trailer. And as you can from see from this 2 minute spot, the next installment promises plenty of action, adventure, and some serious divergences from the source material. In the last movie, the characters had just survived their encounter with the cave Orcs, Bilbo found the One Ring and “won” it from Gollum, and the company was on its way to Mirkwood. 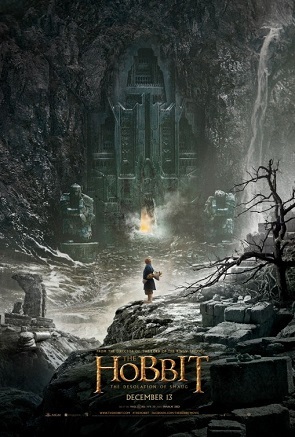 In this installment, things appear to climax when the band of merry dwarves, a hobbit and a wizard reach Smaug’s lair. Some serious changes are showcased with the addition of Legolas (who wasn’t even in the first book), mini battles that didn’t happen, and lots more portentous talk that connects it all to the original trilogy. But that’s just me! Enjoy the trailer and, if you’re so inclined, the movie on the silver screen! The Future is Here: Lab-Grown Burgers! I know!! What’s up with the trilogy?!? So greedy. They should have released the Hobbit as a single three-hour movie. Of course, they probably figured they could spin it out for three years and make it into three separate movies, which of course would result in far more $$$$$. Meh. I will sit this one out too and watch it on DVD.